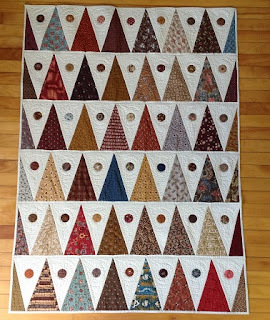 When Mary Elizabeth Kinch posted this quilt as one of her 12 Days of Christmas quilts, I immediately fell in love with it. I can’t explain why as it is not my favorite color scheme and I don’t often like a wide sashing. It just caught my eye. So, when she announced that she was going to do a sew-a-long with this one, I just couldn’t say no (I know, I need professional help). 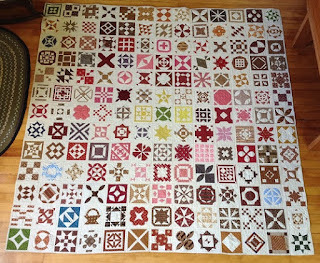 I have decided to reduce the size of the block from 12" to 8" and – wait for it – yes, I am going to make it in the potholder method. Although its palette is much more complex, it "reads" red, white and blue to me. 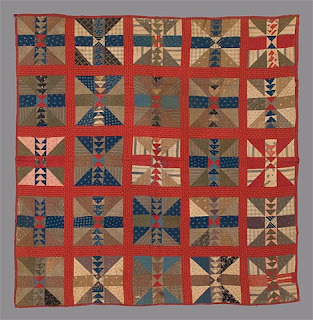 Because I am in charge of "veteran's quilts" for our group, I use this color scheme a lot so I pondered different color choices. I was really tempted to do this in neons, but I thought my Noah and Matilda blocks might be jealous! As with all my potholder quilts, I started to conjure up names with some sort of cooking reference. 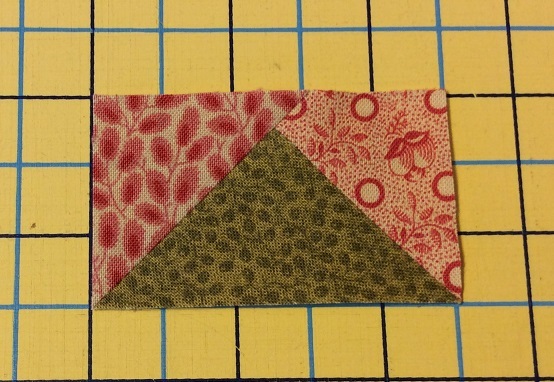 Given that there are a lot of Flying Geese in these blocks I decided on “Gooseberry Pie”. The color scheme reflects the colors of the gooseberry plant. Brown for the stems, bright green for the leaves, pink for the blossoms and red, purple, peach and soft yellow for the fruit. The plant is often a host for white pine rust. Since our state flower is the White Pine cone and tassel, it is illegal to plant gooseberries in Maine. In high school when our out of state friends were getting busted for growing “pot”, we were getting pinched for planting gooseberries! Mary Elizabeth shows us how she makes her Flying Geese units (here). 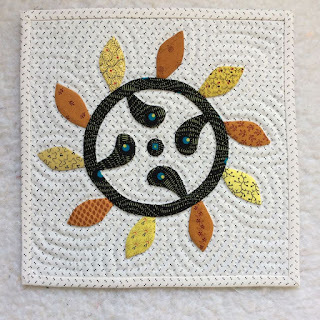 When I am making many in the same colorway, I usually piece them in a square in a square and trim them down to the size I need. 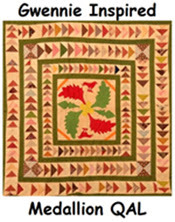 When we were making our Stars in a Time Warp with Barbara Brackman a few years ago, she asked us to think like a 19th century quilter. 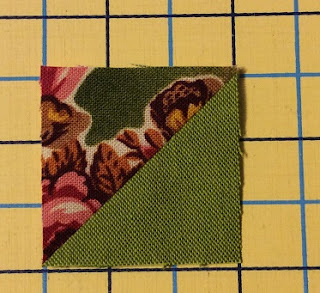 I have tried to implement that in this sew-a-long with the carefree cutting of stripes and plaids and adding a little variety to each block (often a necessity in the 19th century, just plain fun in the 21st). I did not make the obvious mistake in block #2. No one makes more mistakes than me, but they are all quite by accident and I never leave them in the quilt (ah, o.k. once or twice when I didn't notice it until after it was quilted!). 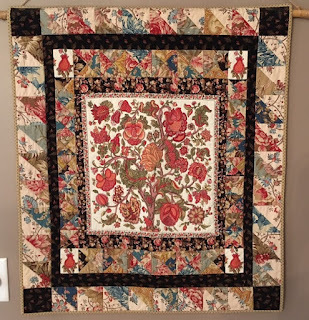 Because I am doing this in such different colors from the original, I printed the photo of the quilt in black and white so I just need to be mindful of value. I'm not extremely happy with either block #1 or #2. I'll keep tweaking, so everything may change with the next few blocks! 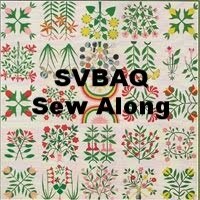 Even if you are not up for the sew-a-long, you will enjoy reading Mary Elizabeth Kinch’s tutorial (here). She is a wonderful writer. Her Blog and her books are always fun to read. 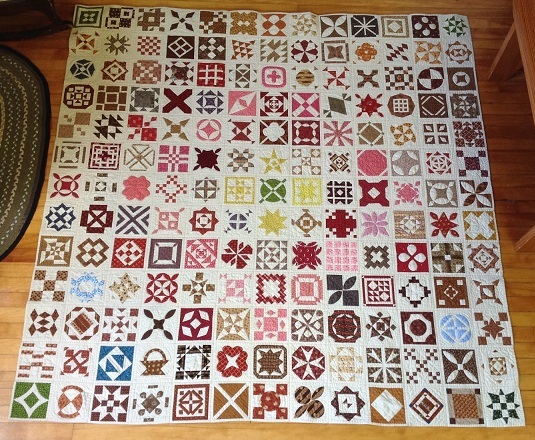 As she says in her post, "we can learn so much from this quilt". I've learned a lot already! Have fun! 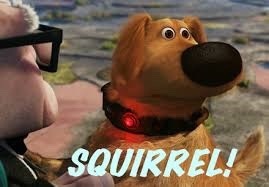 These Olympic games are killing me! I enjoy every part of the winter Olympics except for the lack of sleep! I’m just not used to staying up so late. 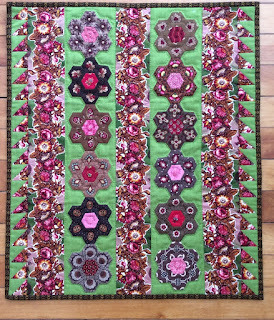 My quilting has taken a back seat this past week, so I will show you a little quilt I made for my niece. I took the photo while at her house a while ago. I love it when the younger generation appreciates the finer things in life – like quilts of course! I cannot remember where I got the center panel, but I surely would love to find another one. I love this quilt (and my niece!). Hope you are enjoying these wonderful young people fulfill their dreams. I think every one of them deserves great admiration, whether they make it to the podium or not. Their grit and determination is amazing! Warning, short month - long story. It’s ironic that February is the shortest month because I spent more time on this little quilt than any other mini quilt I have made! 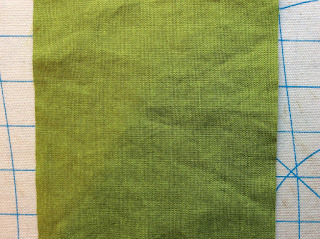 While on a really fun trip with 4 of my seven quilting sisters I found this “frog” green fabric at Quintessentials in Auburn, Maine. Kathy said it really looked like me and since she is always right, I bought a yard. We were planning a bus trip to the shop again in 2 weeks and I decided to use this in my February mini so I could show the girls (and Betsy, the shop owner) what I did with it. 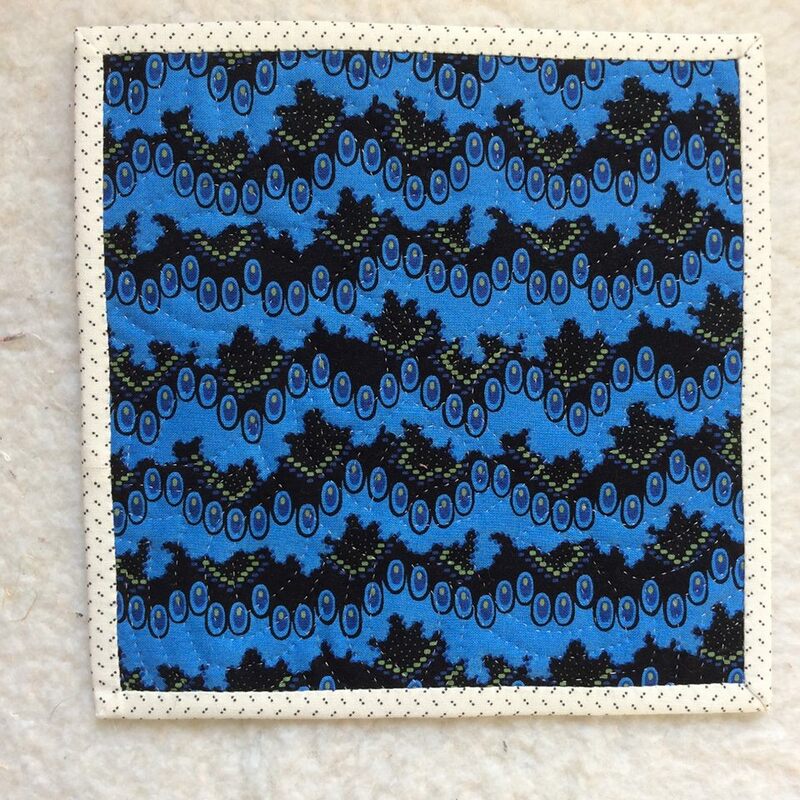 I thought I would cheat a bit by using some hexie blocks that were already pieced. I have over 100 just sitting around waiting to be used so, why not? I love strippy quilts making the idea for the design and easy one. However, by not using one of those measuring things (you know – a ruler! ), I mentally calculated the width of my strips and figured 4 hexies in each strip would suffice. Yes, it probably would have had I actually measured it! So, by now you are getting the picture. Luckily I had cut the background large enough to add an extra hexagon on each strip. 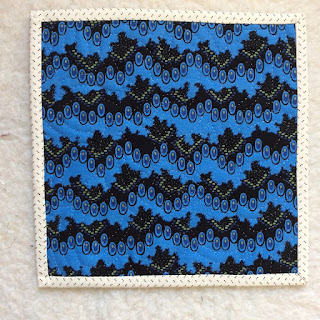 I had picked out this fabulous fabric from the Mechant’s Wife line by Terry Clothier Thompson. It was a wonderful line of fabrics based on a c1840 antique quilt top she found in Maine. Realizing that now would be a good time to pick up a ruler, I carefully cut each strip making sure that some of the green was still evident. 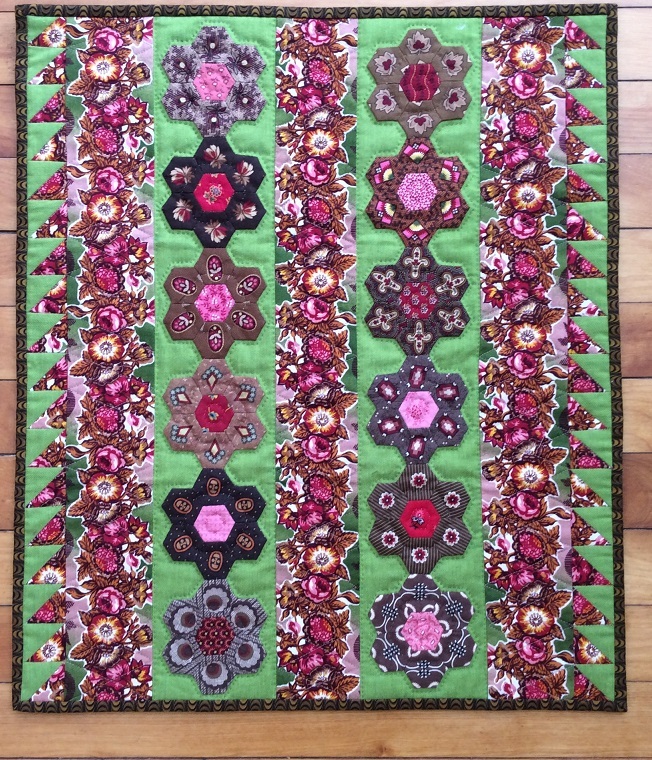 I hand appliqued the hexies to the background and pieced the strips together. I split a piece of Dream Wool in half and used a fabulous pillar print from Di Ford on the back. I have to say that Di Ford’s fabrics are to die for (no pun intended!). I even had enough of it to match the triangle corners for hanging. After I hand quilted the hexie strips I decided that the proportion was just not right. It really needed to be wider. 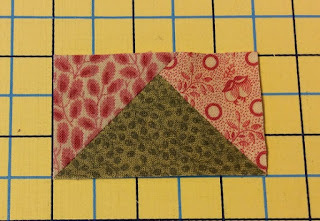 So… out comes the ruler again and I made 40 little 1” finished half square triangle to add to either side. It was lucky (since it surely wasn’t planned) that the backing piece was large enough to accommodate the added width. Because I wanted to finish this before the bus trip I decided to machine quilt the alternate strip and the half squares triangles. While auditioning fabrics for the binding, I felt that the white outline on the Merchant’s Wife fabric was a bit too stark. I thought about dying the entire thing, a risky maneuver! I experimented with coffee and with Rit beige dye. 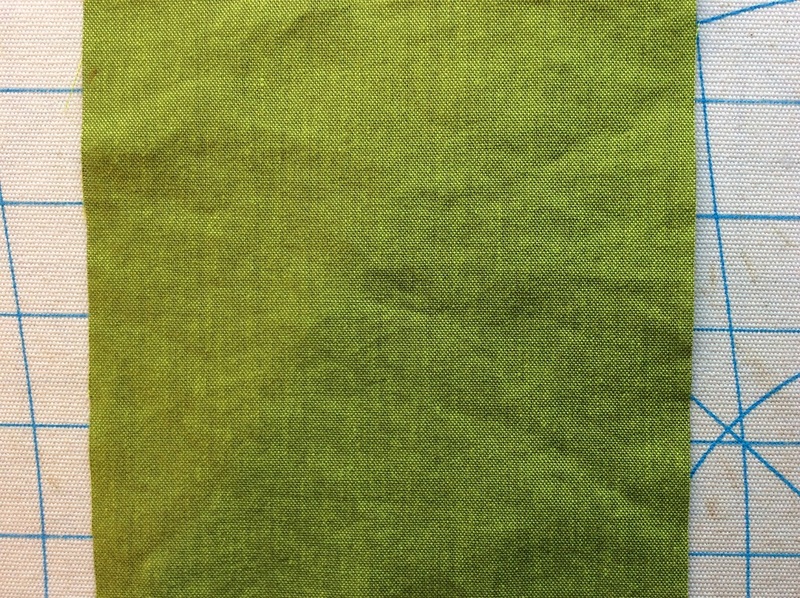 But, since the entire project began with this delicious bright green, I really didn’t want to dampen it. I thought about filling in the white edges with a gold-ish Pigma pen. Ah, nope, I’m calling it good enough! 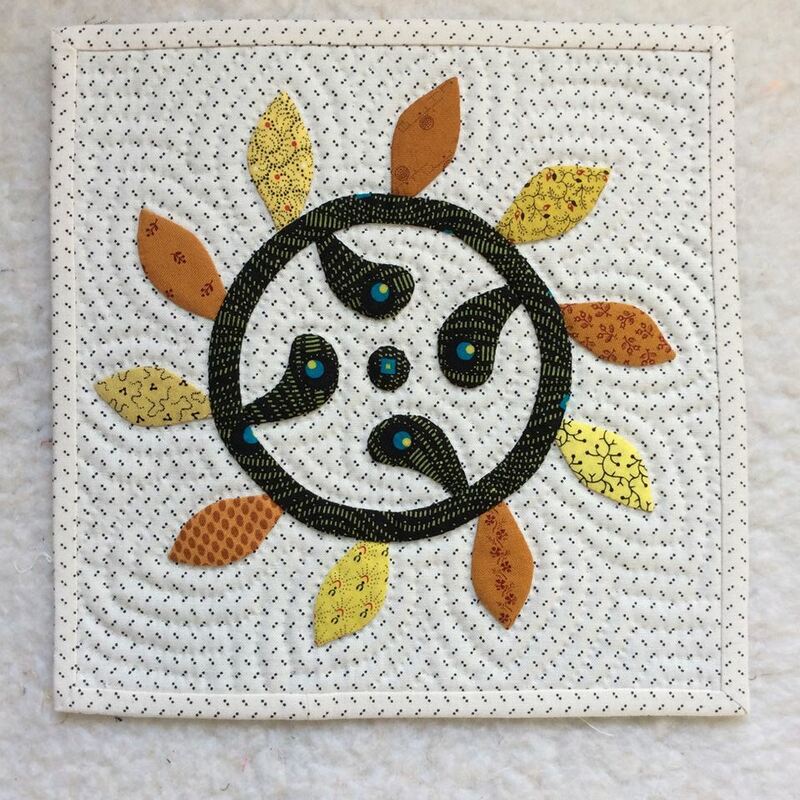 I am happy to say that Kyle (Timeless Reflections), Barbara (Quilts Gravestones and Elusive Ancestors) and Janet (Rogue Quilter) have joined in the fun. Visit Kyle’s post (here) and Barbara’s post (here). 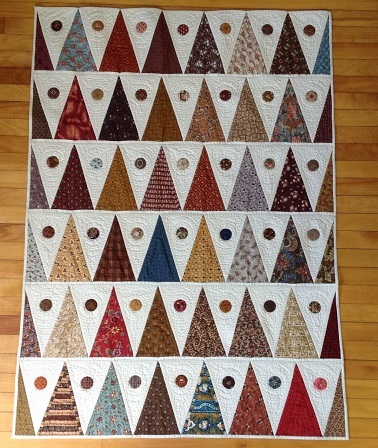 And, see Janet's post (here) for her January quilt and a wonderful tutorial on mini quilts! I am really looking forward to round two! I will work on figuring out how to link up by the end of next month so if any of you want to join us you can jump right in! Once again, I have bitten off a bit more than I should be chewing this month so I am happy that I decided to keep these little baskets simple. We were to make a minimum of 8 blocks per month in January and February so, of course I made the minimum! Please visit Cecile’s Blog (Patchwork Inspirations) and her Facebook page to see all the wonderful little baskets! Stay tuned for the big “reveal” of the quilt in March. I am either working on too many projects or not enough! I am really enjoying the Noah and Matilda sew-a-long (visit the Facebook page here). I am making them in numerical order to ensure that I WILL make all of them and not just the easy ones. For some reason I skipped right to block 2D last week and missed posting these two. Block 6C was another favorite of mine. I love the crazy shape of this “flower?”. 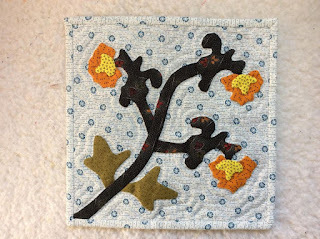 I used an antique fabric for the background and it was so thin that I was afraid it might bleed through to the backing, but it turned out to be just fine. Block 1D is a bit skimpy for my taste. I like a robust wreath with chunky petals (I can’t wait to get to 5D – nice big petals in the flower!). I did add one petal to make the alternate cheddar and yellow colors work out symmetrically and I added the little neon circle in the center. The backing on this one is one of my favorite neons (I seem to be saying that a lot about these super neons!). So, back to work and I’ll try to post them in order! 2D or Not 2D, that is the question! I really cheated on this one, but if you haven’t seen the original (here) you would never know. What? The link doesn’t work? Oops! Seriously, you must see the original Noah and Matilda quilt (here) and enjoy all the renditions on Dawn’s Noah and Matilda Facebook page (here). And, I would like to thank all who read my last post for not correcting my spelling! My friend pointed out to me that I spelled “glutton” as “gluten”. I must have been in a bread coma! The quilt, not the movie (although I love both). Some of you remember my fateful “Dear Jane” saga with her wavy borders. If not and you are a gluten for punishment you can read about it (here) . have been lying around collecting dust for months. My friend, Laurie LaBar (Chief Curator of History and Decorative Arts at the Maine State Museum), came by a few weeks ago to look at some of my quilts for the possible inclusion in an upcoming exhibition. She liked “Half Baked Jane” for a number of reasons (visually and culturally) and made the comment, “it’s too bad it doesn’t have a border on it”. Laurie is one of the sweetest people I know and she would never have said this if it wasn’t true! I realized the quilt really looked “naked”. So, here is her new suit of clothes. I promise there will be no more alterations!